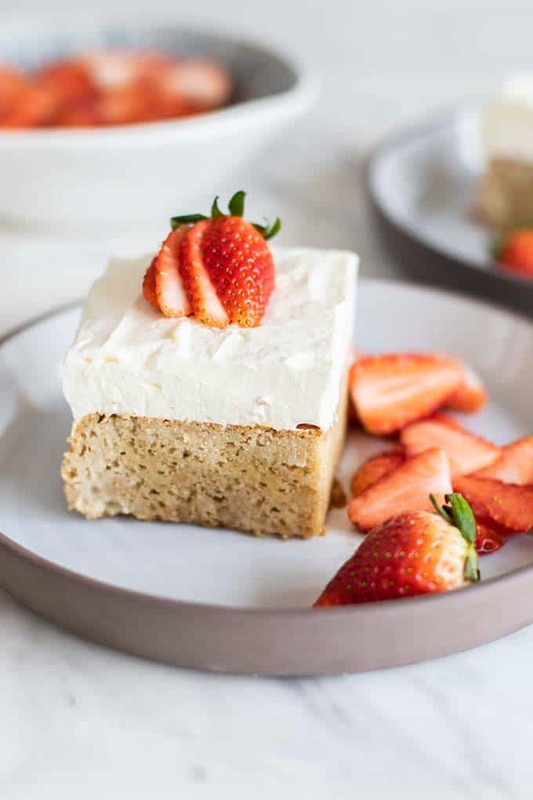 A dairy free and gluten free Tres Leches Cake, perfect for a spring gathering! 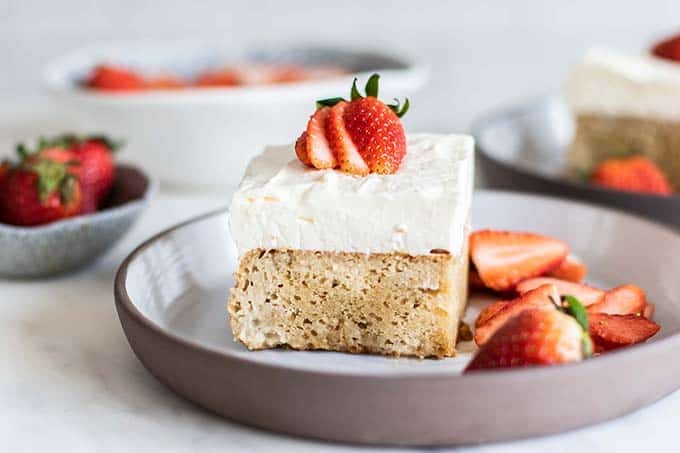 This healthier Tres Leches is made with a fluffy almond flour cake and is soaked in a lightly sweetened coconut milk, and then topped with fluffy coconut whipped cream. 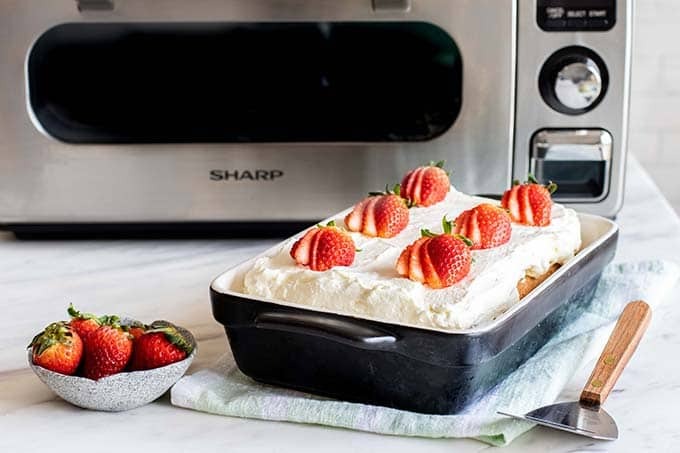 Serve with strawberries for a light and elegant dessert. Tres Leches is a classic Mexican cake, made by soaking a vanilla cake in 3 milks; cream, evaporated milk, and sweetened condensed milk. It is topped with a fluffy whipped cream topping. Making this dessert gluten free and dairy free took some creativity, but the result is so delicious! I made this using my almond flour cake recipe, and then soaking it in a lightly sweetened coconut milk. Instead of a whipped cream topping, I used coconut whipped cream. 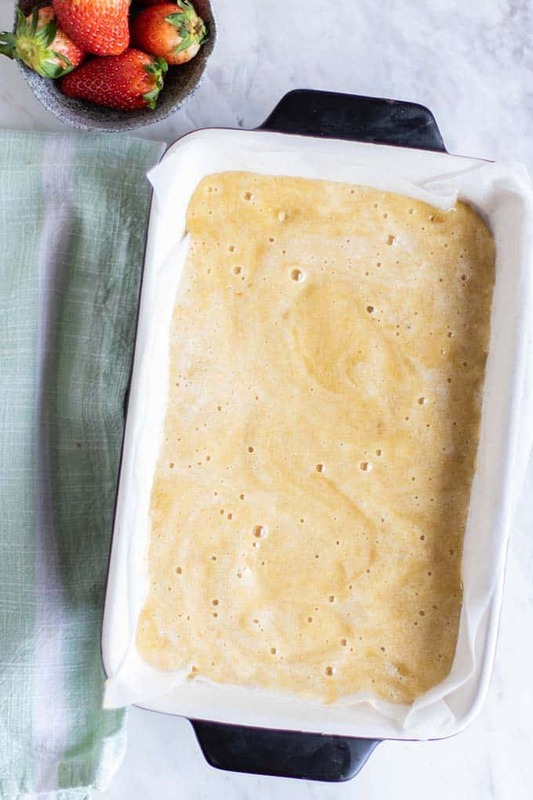 The cake is made by mixing an almond flour base with whipped egg whites, so the cake comes out light, and perfect for soaking up the sweetened coconut milk. The result is a cake that is just as decadent, but more crowd-friendly. The first step is to make a vanilla cake. I found that an almond flour cake was the perfect consistency to soak up the coconut milk, without getting soggy. I baked this in my SharpSuperheated Steam Countertop Oven. Since it doesn’t need to preheat, it’s ready when I am, and it keeps gluten free baked foods from drying out. After the cake cools, flip the cake upside down in the pan (this is why I use parchment, to make it very easy to remove from the pan), and poke the underside with a fork to make lots of holes. Whisk a little honey (or date syrup) into some full fat coconut milk, and then soak the cake in the mixture. This makes the most moist cake! The best part — the whipped toppings. 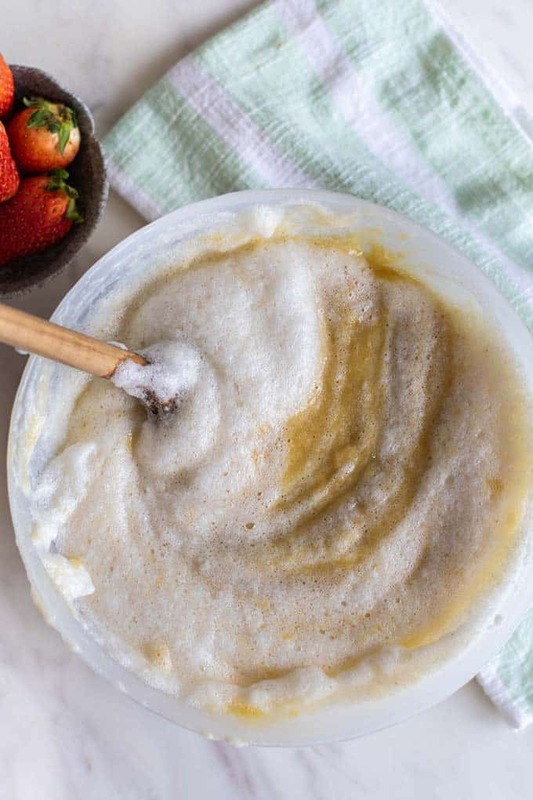 You can use a classic whipped cream if you aren’t looking to keep this dairy free or paleo, but I like to use coconut whipped cream. My secret is to use a very cold bowl, and whip the frosting beyond the point where you think it’s ready, until it’s very stiff. This way you can cover the cake in a thick layer that will come out in beautiful slices. 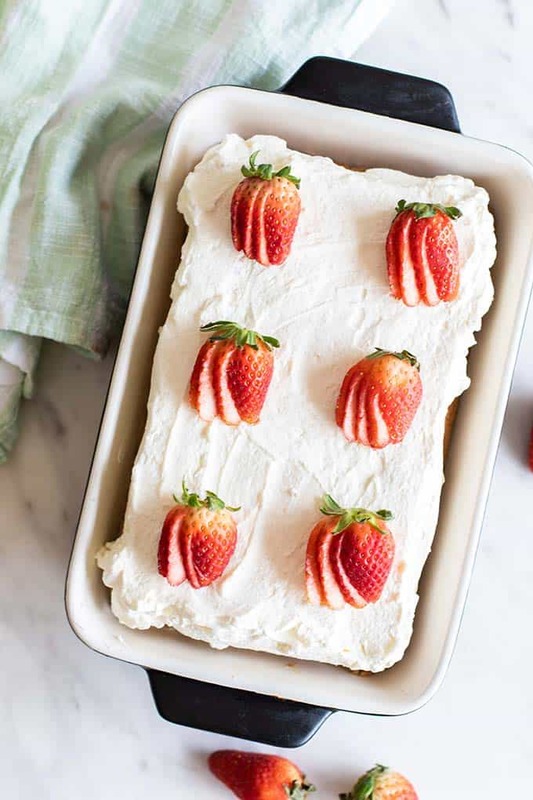 Top your Tres Leches cake with strawberries or any other berry. Raspberries spread out over the top are equally delicious! This tres leches cake needs refrigerated until ready to serve because of the whipped topping. 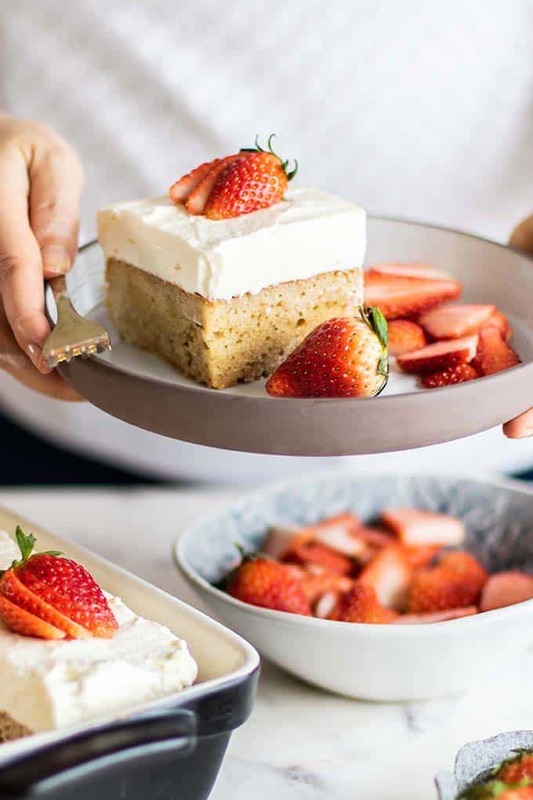 We enjoy this cake with lots of fresh strawberries sliced and served with it! 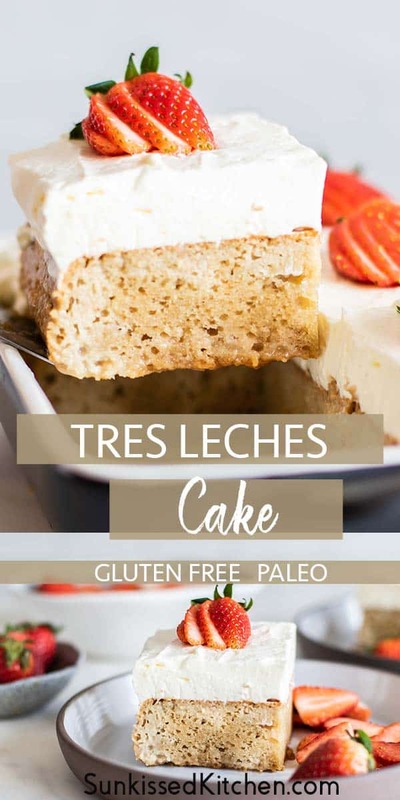 This Gluten Free Tres Leches Cake post may contain affiliate links, meaning if you make a purchase, I will receive part of the sale as a commission. This helps me continue to bring you lots of fresh and inspired recipes!